With the quality and availability problems that CCH has had with their Alien cams, aid climbers and free climbers alike will be happy to hear there is now another option for small offset camming devices. Metolius has extended their existing Ultralight line to include offset TCUs. These new offset TCUs are available in 5 sizes ranging from #0/00 to #3/4. The offset design has been known to work particularly well in flaring cracks or pin scars. 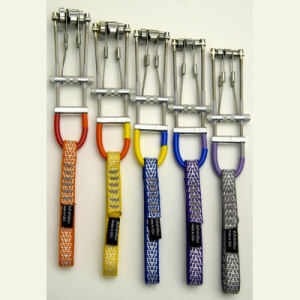 We got a prototype set here at CascadeClimbers.com to try out (our set was missing the middle size #1/2), and minus some adjustments to the color coding, these prototypes are what is available today at gear outlets. It can take a while to form an opinion about cams, though some people make their choice rather quickly based on basic cam design, how it works with their hand size, or other personal preferences. I won’t try to measure cam performance in this review. That would require a qualified engineer with the resources to do a wide variety of tests, including destructive testing tolerance testing. Instead I’ll share some dimensions, make a few observations, and let you come to your own conclusions. We used these TCUs ice climbing, aid climbing, and free climbing. As I said, it can take many pitches to develop an opinion about a cam design. The best way to see if these TCUs are for you, of course, is to buy or borrow a set and try them for yourselves for a while.